Hudson RCI Pocket Chamber is anti-static and clear chamber that is designed for portability and convenience to accommodate the varied lifestyles of patients with asthma. It features a tethered cap to protect the mouthpiece. RCI Pocket Chamber is to be used with Pocketpeak Peak Flow Meter. It's a compact spacer/chamber for albuterol. RCI Pocket Chamber fits in my purse, car console, pockets, etc., and it works great. Thank you for reaching out to us. 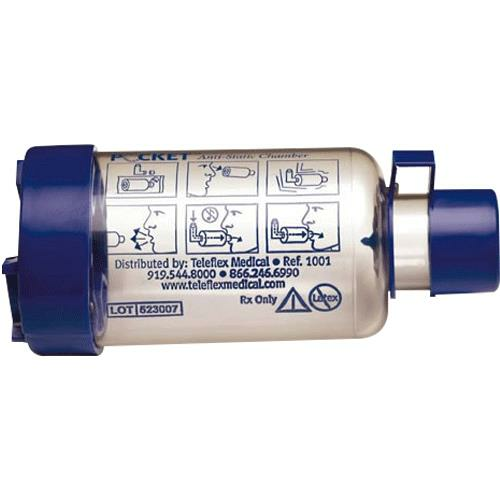 Hudson RCI Pocket Chamber features one-way valve that helps to prevent patients from inadvertently blowing medication out of the back of the chamber and may aid patients that have difficulty timing their inhalation after actuating the MDI canister.